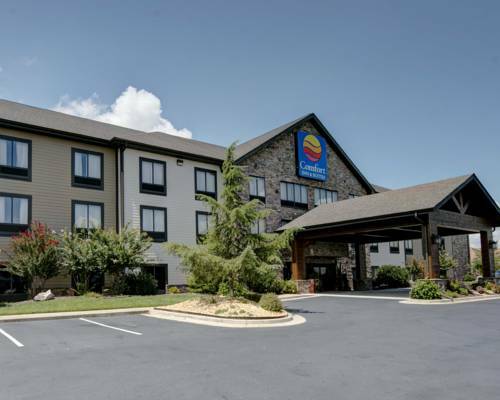 Get rested and ready for anything at our Comfort Inn and Suites hotel, nestled near the Blue Ridge Scenic Railway in Georgia. Our smoke-free hotel is close to the Appalachian Trail, Blue Ridge Lake, Blue Ridge City park, Mercier Orchards and Main Street. Our pet-friendly hotel also offers guests a free breakfast, free WiFi, fitness center, meeting space and bus parking. Each guest room comes equipped with a TV, coffee maker, hair dryer, iron and ironing board. Join our Choice Privileges program today and start earning rewards points with your next stay. *Some amenities may require an additional charge. Pet Accommodation: 50.00USD per stay.Non-Refundable. Pets cannot be left unattended in any rooms. ~46 miles from Blue Ridge. ~57 miles from Blue Ridge. ~74 miles from Blue Ridge.